Here is a kit to replace the shock cord on any Coleman Camper. This kit has 30' of the highest quality shock cord I can find. It also comes with as many hooks as you need. The older Coleman's' had a single length of shock cord for the bed. The King/Queen needs 14' and the double needs 11'. For the 2004 and newer models you need two shorter 5' lengths on both sides of the bed and hooks on each end. With this kit you are sure to have a little left for another project you may dream up. I used mine to hold my leveling blocks. This is used with either plastic hooks or "Hog Rings" to make the connection. The shock cord attaches the tenting material to the beds once they are pulled out. There is a life to these cords and I have had to replace both my old 1997 and my newer 2000 model Coleman Camper. I, like most, did not want to spend an arm and a leg for shock cord and went to Ebay and found 50' for some unrealistic price. Well I ordered it and I found out why it was priced as such. Below is a photo of a selection of shock cords I have tried from various suppliers. They are all sold as 1/4' cord. That is the size Coleman used for the original equipment. Even though they are all sold as 1/4" they are not all the same. They are actually different sizes!! Who would have thunk. Well, I wanted to know more. The shock cord I pulled from my Coleman lasted for quite awhile. I started to dissect my original. I found it had almost 100 small strands of rubber. I pulled apart my China made Ebay bought cord. This is pictured on the far left. TO my surprise it only had 20 rubber strands and was thinner than the old stretched out Coleman. I tried again. Another order and another disappointment. I found the next cord had more strands, but they were square? What is this all about? Well, I found out the round design will let the strands roll past each other and last more stretches. After a few more tries (I did not show all I tried) I finally found one I was willing to sell. I do sell shock cord kits for the Coleman Double, Queen or King bunk ends. 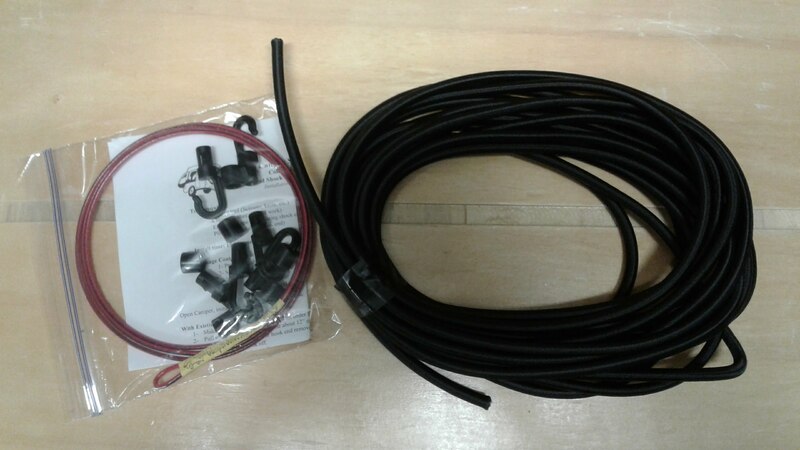 These are precut lengths of shock cord, with plastic hook ends (works for years that previously used Hog Rings) and most important a tool with directions to install the new cord. The process takes a little over 5 minutes for each end with the simple to follow directions. The shock cord I finally found is made in Canada (North America at least) and has a UV abrasion resistant outer shell with over 90 strands of round virgin rubber core. This is actually a bit over 1/4" but will fit and last probably longer than your trailer will. This is actually designed and used by one of the hardest industries in outdoor environments. Basically I know it is tested in some harsh conditions. If you take anything out of this. Shock cord is not all made the same. Keep these things in mind when buying shock cord. Pay the extra money and get a lifetime cord. If you want, I am happy to supply cord from my spool. I did the trial and error to find a great product. Get the best shock cord you can.